I’m really a lazy girl when it comes to fashion. 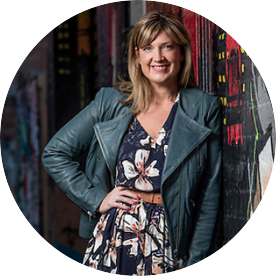 Sure I love the research, browsing and wearing part of fashion, but when it comes down to it, I usually get dressed in all of five minutes – often with an audience – and have an unhealthy reliance on dry shampoo. I want need my clothes to do ALL the work. Like many of us, I don’t have the time or energy to put together endless combinations or workshop what to wear with what every morning or wonder what I’ll feel comfortable in for any given scenario. That’s why I always gravitate to clothes that feel great, can be literally thrown on, are comfortable to wear ALL day long and tick a style box or three. In my quest for the most wearable but fabulous wardrobe, I always make a point of checking out the latest offerings from two of my favourite Australian brands – Elk and FRANKiE4 Footwear. Both labels specialise in creating functional and practical pieces that are also thoughtfully designed and beautifully made. In fact, as these latest offerings attest to, they also pack a serious punch in the statement style department. 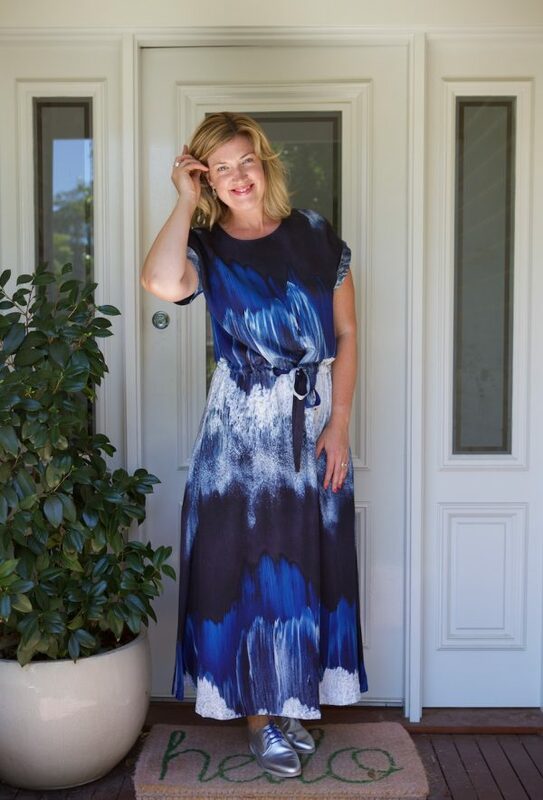 Below I’m wearing the Water Print Maxi dress* from Elk which is part of their new Autumn 2018 range SOLACE which was photographed in and inspired by the natural contrasts of the rugged and remote New Zealand coast. On my feet I’m wearing the brand new BETH derbys in silver from FRANKiE4 Footwear. Where to start with this beautiful dress? 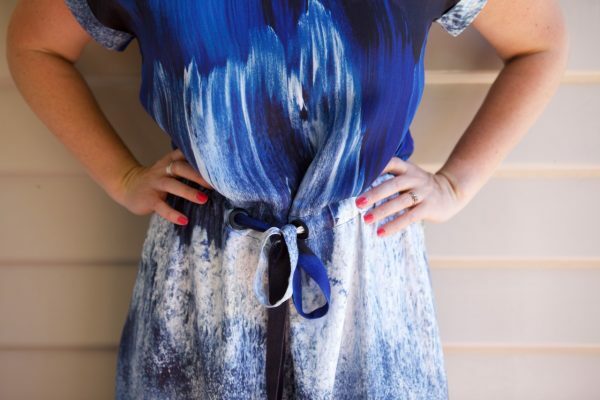 Well, aside from this stunning and exclusive Elk yardage print, this dress is made from 100% viscose. 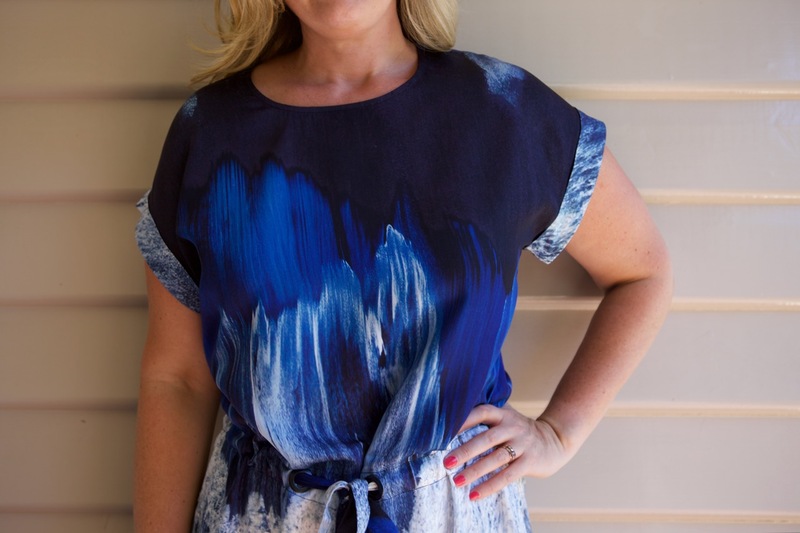 It’s a medium weight silky feel fabric which drapes beautifully, creating a flattering silhouette. Size wise, this dress is slightly on the generous side. I’m wearing a size 12 and it’s drapes perfectly without clinging at all. 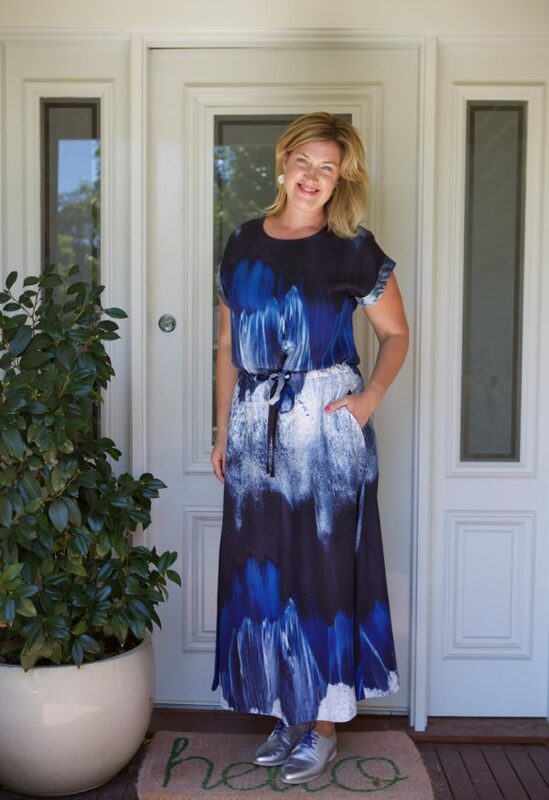 The Water Print Maxi dress is designed to be worn either undone or cinched into the waist using the fabric belt. The belt can be drawn in more or less too depending on your preference and shape. I’ve cinched in quite a bit to create more of a waist. If you’re a details girl like me, you might also like to know that the front of the dress has a large matte enamel eyelet feature, a keyhole opening at back and – PRAISE BE – side seam pockets. If you love this print, you’ll be very happy to hear it’s also available in a long sleeve shirt dress, top and maxi skirt. Check out all the new arrivals here. Finally, how cool is it when your new kicks perfectly match your fab new frock? 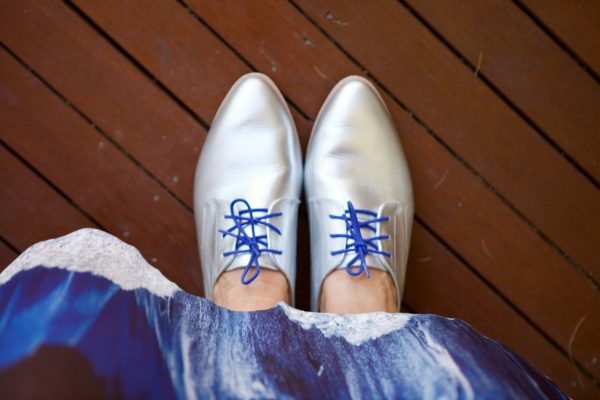 I’m very partial to a derby or two and the silver was my pick of the current crop of newbie BETH – although I am hoping to add a metallic into the mix – especially paired with these contrasting blue laces. Fun, comfortable and fabulous – what’s not to love? You can check out the full range including the BETH derbys in silver out here. * denotes items that were kindly gifted to me. All opinions and comments are my own. This post also contains affiliate links. You don’t pay any extra and I earn a small commission. For more info, please head to my Disclosure Policy here. Have you checked out the latest drops from Elk and Frankie 4 Footwear?